Ken Alder was born under the sign of Sputnik, and has devoted his career to the study of the history of science in its social and political context. Alder was conceived at Bell Labs in Murray Hills, New Jersey the same year that the U.S. launched its first telecommunications satellite. 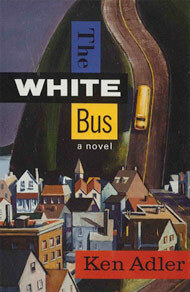 And he was born and raised near Berkeley, California, where was part of a bussing program to achieve racial integration, an experience which served as the subject of his novel, The White Bus, published by St. Martin's Press in 1987. As an undergraduate he studied physics at Harvard University, where he also received his Ph.D. in the history of science in 1991. Alder is currently writing a history of the forensic sciences from the Renaissance to the genome. The book will document how the techniques of bodily identification—techniques developed by the law to mark us out as individuals, and thereby prove who did what, when, and where—have also shaped our identity—that is, our sense of who we are. Specifically, the book will show how these forensic techniques have defined us both “horizontally” in terms of race or group, and “vertically” by placing us in a historical lineage. The project will compare how these techniques of expert indentification have developed in the Anglo-American and French-Continental legal systems. Successive chapters will focus on the bodily traces left by handwriting, bones, fingerprints, blood, and genes. The project has been supported by grants from the National Science Foundation and the Guggenheim Foundation. 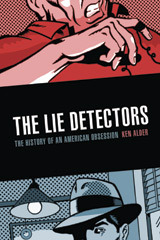 Alder’s most recent book of history, The Lie Detectors: The History of an American Obsession, was published by The Free Press in March 2007, with a paperback edition published by Bison Books in 2009. The book has also been translated into Japanese and Czech. The Lie Detectors traces the history of the polygraph technique in America—the sole country to make use of this method. It shows how even after it was banned from the U.S. criminal courts, the polygraph became central to the workings of the American justice system, the national security state, and the management of American corporations. The book follows the careers and misadventures of the rival creators of the lie detector: John Larson, the nation’s first Ph.D. cop, who married the first person he tested on the device; Leonarde Keeler, the high school amateur magician, who taught cops how to use the device to extract confessions; and William Marston, who went on to invent the cartoon character, Wonder Woman. The Lie Detectors explains the public appeal of the technique as a dispassionate arbiter of public justice, while documenting how, behind the scenes, it has transformed justice into a game of bluff and bluster, becoming central to the plea bargaining system. The book uses the history of this bizarre device to examine the fraught relationship between science and justice in twentieth-century America. Alder’s previous book, The Measure of All Things: The Seven-Year Odyssey and Hidden Error that Transformed the World, was published by The Free Press of New York in October 2002 and by Little, Brown of London in September 2002. It has been translated into French, German, Spanish, Portuguese, Dutch, Italian, Swedish, Norwegian, Japanese, Chinese (simple and complex characters), and Hebrew. The book won the Davis Prize of the History of Science Society, the Dingle Prize of the British Society for the History of Science, and the Kagan Prize of The Historical Society. The Measure of All Things tells the story of the two astronomers sent out from Paris in the midst of the French Revolution to measure the size of the world, so as to define the new “meter” as one ten-millionth of the distance from the north pole to the equator. The book reveals the secret “mistake” committed by one of the two men, and describes the new understanding of scientific error that emerged from their efforts. To everyone’s surprise, the metric system—designed to ease commerce and simplify the administration of the state—was bitterly resented by the citizens who were meant to benefit from it. This is the story of how one of our most banal acts—the use of measuring sticks—is in fact a product of human drama and passionate struggle. 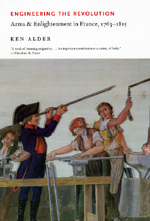 Alder’s first book of history, Engineering the Revolution: Arms and Enlightenment in France, 1763-1815, was reprinted in 2010 in a new edition by the University of Chicago Press, having first been published by Princeton University Press in 1997. The book won the 1998 Dexter Prize (now Edelstein Prize) as the best book published in the field of the history of technology. The book offers a total history of a particular artifact—the gun—as a way to rewrite the history of the Enlightenment and French Revolution. The book does this by exploring the forging of a new relationship between science and politics at the moment of their modern birth. Specifically, it documents how a group of old regime artillery engineers developed a new form of engineering rationality to aid in their redesign of gunpowder weaponry, and then applied those same rational criteria to differentiate among themselves, thereby creating a new form of meritocracy. The result was a new kind of technological life, one which redefined the relationship between the state and knowledge-making, private capital and war-making, and the nation and the social order. Since 1991, Alder has taught at Northwestern University, where he is Professor of History and Milton H. Wilson Professor in the Humanities. He also founded the Science in Human Culture Program, which is Northwestern’s program in science studies. He has held research grants from the Guggenheim Foundation, the National Science Foundation, the National Endowment for the Humanities/Newberry Library, the American Bar Foundation, and the American Philosophical Society.